Feeling a little uncomfortable in public while dating someone of a different race is expected. After all, there's still some people who will react negatively to it and it was just a few decades ago that the act was completely illegal. However, interracial couples are becoming more and more common and the act itself is becoming normalized. Dating someone of a different race is something that happens and the older generations will have to deal with it, whether it's white women dating black men or any other race. In this context, open mindedness doesn't involve being willing to date someone of a different race but rather being willing to embrace, or at least roll with, the differences that come from such an experience. Simply put, white women experience the world in a completely different way as white men, so disagreements and misunderstandings are to be expected. Accept that it will happen and react accordingly when it does. 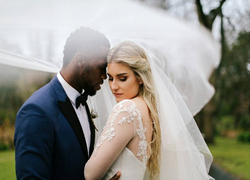 In the world of interracial relationships, there are amazing people who are genuine in their intentions of dating someone from a different race. There are also plenty of people who see it as an experiment and will see you as a novelty rather than a person. Learn to identify and avoid the later, as you deserve better than someone who only wants you for the color of your skin. While interracial relationships are becoming more and more normalized, the truth is that there's still people, generally old, that see something wrong with it, particularly when it comes to white women black men dating. They're the ones in the wrong, not you, but you'll still have to face ignorant people from time to time. When that happens, try not to take it personally and acknowledge that those people are simply out of the loop and too stubborn, or old, to change their views. This doesn't mean you shouldn't be offended, but it's important to understand that 99.99% of those people have no say in your relationship unless you let them. Whether you want to accept it or not, if you're dating someone of a different race to challenge expectations, you're being as shallow as a fetishist and probably more than a little bit racist yourself. If you're planning on jumping into an interracial relationship, do so because you love the person you're dating, not because you want to shock your parents or friends. If the appeal of dating someone from a different race lays entirely on you looking open minded and "woke", do us all a favor and walk away. It's for the best.